Trump has to deliver on something regarding the wall, he based his 2016 campaign on border security. Democrats can’t cave on a key Trump initiative at the outset of their new House majority. And Trump can’t cave to House Democrats. There is no end in sight, but can Democrats get a face full of buckshot in this fight? Yes, Trump and the GOP are being blamed more…because what else is new. But voters agree that there is a border crisis, and support for the wall has risen. 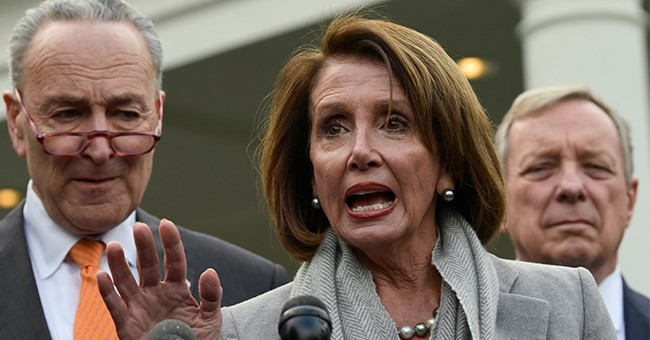 With the government shutdown, you have Speaker Pelosi screwing around with the State of the Union, virtually disinviting Trump over nonsensical security concerns and her party absconded to Puerto Rico during the shutdown. So, spare me the ‘those poor government workers’ lectures from the Left; they don’t care about them. RealClearPolitics’ Tom Bevan said last week that Democratic intransigence could bite them in the end. And while this deal offered by Trump isn’t the best, and certainly not warmly received by his camp, it’s at least something to go on for future negotiations. People are in favor of border security. People also don't want the government shutdown. Polling right now shows that people are holding Trump responsible but I think Democrats are starting to run the risk of intransigence. Not even showing up to bargain at all and even arrogance, being on junkets in Puerto Rico while the government is shut down. That's not a good look for Democrats and that may end up hurting them in the long run if this continues to go on. Trump still has a national emergency in his back pocket, he may use it if it gets to the point where he has no other options because he just can't capitulate.